Utilities traditionally haven’t had to consider the vagaries of consumer behavior as a big part of their grid investment and power procurement plans. But with the rise of customer-owned solar PV, plug-in electric vehicles, demand response, behind-the-meter batteries and other distributed energy resources (DERs), leaving the customer out of the equation is no longer an option -- at least, not for the Sacramento Municipal Utility District. In fact, the utility DER projects that its customers and third-party companies are financing total around $150 million to $200 million per year. That’s more than what SMUD spends on all the utility-scale solar and wind energy it's procuring to meet the state’s renewable portfolio standard, indicating how important a role they will play in the utility's carbon and green energy goals. These DERs are largely outside utility control. But they have an increasingly important impact on how SMUD operates and invests in its grid and procures power for future years. At the same time, there are also opportunities for utilities to explore new financial structures and business models. This week, SMUD, the Smart Electric Power Alliance (SEPA) and engineering firm Black & Veatch released a report that could lay out a new model for utilities struggling to bring DER-equipped customers into their long-range plans. It’s based on more than a year of work integrating dozens of different sources of data about customers, and then using it to predict just how different neighborhoods will adopt DERs at different rates over the next decade or so. Black & Veatch has been working with SMUD on this new approach for two years now, and this approach has now been described as part of SEPA’s “Beyond the Meter” research into how utilities can plan proactively for a distributed energy future. The latest report, the fifth in the series, is the first time SEPA has been able to apply its new concepts to a real-world utility. “In terms of how this compares to what other utilities have done, SMUD is, at least in our opinion and experience, on the cutting edge in terms of DER planning, and putting a lot of different pieces together,” said Dan Wilson, manager at Black & Veatch. Utilities around the country are exploring DERs as grid assets. California’s investor-owned utilities have created DER capacity maps for their distribution grids, and are in the process of enumerating their localized values. New York is doing the same under the state’s Reforming the Energy Vision initiative. And big utilities in Hawaii, Arizona, Vermont and other states are doing pilot projects to see how solar, batteries, EVs and building energy controls can be aggregated for local and system-wide benefits. But as Wilson noted: “What I think is interesting about SMUD, and what makes this study kind of unique, is combining these pieces together using the same set of data through the whole process." Those pieces include customer adoption forecasting, distribution grid impacts, bulk power system planning, and broader utility financial modeling. SMUD has incorporated all three elements of SEPA’s protocol for dealing with DERs -- evaluating them as grid assets, integrating customer insights, and reconfiguring the utility’s standard operating practices to make use of these new sources of data. 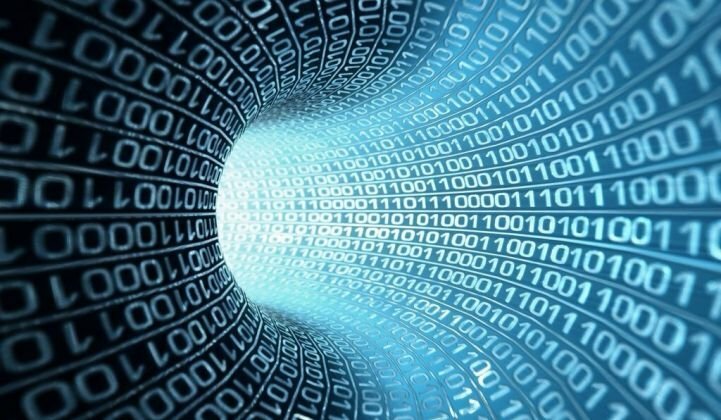 Unlike most traditional utility distribution grid planning, however, this process begins not with power flow models or engineering estimates, but with customer data. SMUD has done a lot of work on the customer engagement and data analysis front, from the efforts to design its time-of-use rates, to its work with solar-plus-storage net-zero-energy projects in Sacramento. But like many utilities, these efforts were often set up in ways that made their data sets different from one another, requiring a lot of cleaning up to integrate into a single database, Wilson noted. The results have yielded a smorgasbord of data to use in modeling and forecasting DER adoption, he said. This includes consumer marketing-type data on historical solar adoption, customer behavior, demographics and segmentation, including PRIZM data from Nielsen, as well as key building attributes such as ownership, square footage, age and unit size. SMUD’s smart meters, meanwhile, yield granular electricity usage data, along with the critical location data to integrate into the utility’s distribution grid management system. 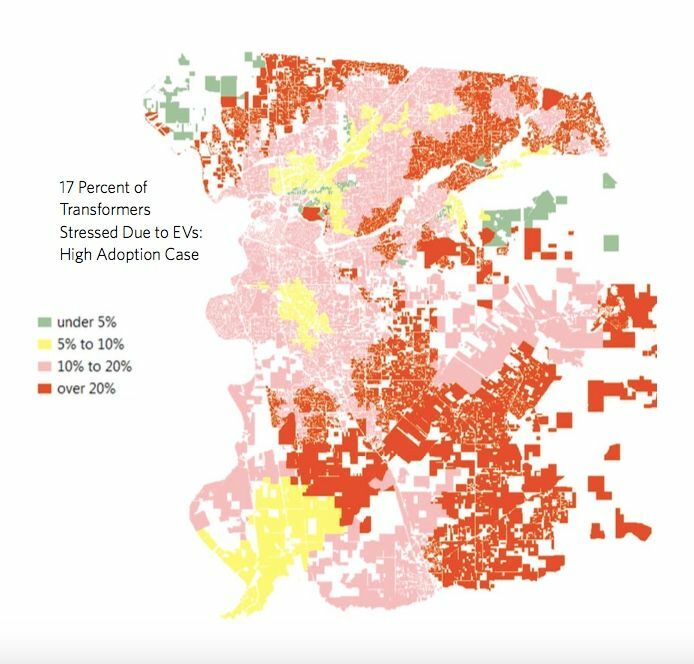 All of this comes together in maps that can give utility planners address- and neighborhood-specific data on load shapes, the presence of DERs, and future investment needs, as shown below. 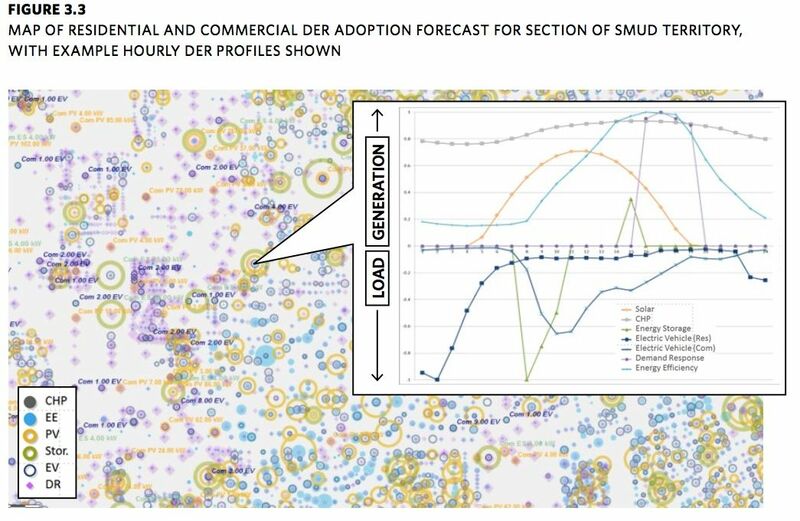 According to this forecast, SMUD has some big potential for DER growth, specifically in solar PV. While its 2030 high adoption case sees about 500 megawatts coming on-line, its technical potential is 3,000 megawatts of rooftop solar, as well as 4,600 megawatts on commercial parking lots. For demand response, SMUD sees a technical potential of 1,220 megawatts, although its 2030 Adoption Case only predicts 360 megawatts. Energy storage predictions, meanwhile, are largely based on linking batteries to help smooth and shift solar power, with the potential for 40 megawatts of customer-owned storage and 160 megawatts of utility-owned storage. For the next step in its analysis of DERs' distribution grid impacts, SMUD and Black & Veatch turned to Landis+Gyr’s GRIDiant software platform. While there were some limitations to the study -- specifically, it used 2013 power flow models, which are unlikely to be accurate for predicting impacts on a much different grid in 2030 -- the analysis did yield an estimated mitigation cost of $50 million to $100 million for “unmanaged DERs” by 2030. That adds up to about 8 cents per watt for solar PV and $100 per electric vehicle. This was mainly driven by EV adoption putting increased stress on transformers, and variable solar PV output requiring investment in voltage regulation equipment. This figure shouldn’t be taken as a given, however, Wilson noted. 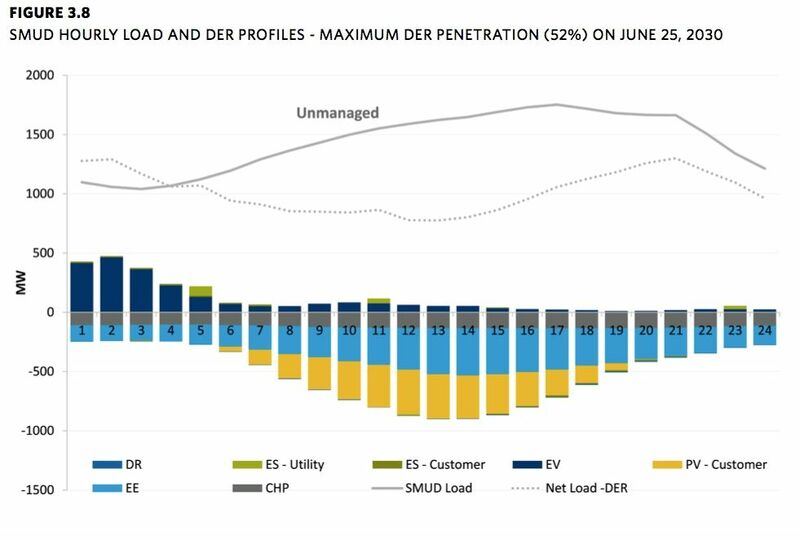 Not only is it based on an old grid model and very specific assumptions, it also doesn't include the potential benefits of "managed DERs" -- batteries, EVs and demand response -- that SMUD can control in some fashion to help serve grid needs. Meanwhile, the analysis of bulk power system impacts of DERs yielded some interesting, and even counterintuitive, results, he said. High DER scenarios through 2030 did lower annual retail electricity sales, as one might expect. But they also reduced peak load by 10 to 20 percent, reduced carbon emissions and power purchases, and led to a flatter net load profile, the report noted. Nor does it consider the potential for electric vehicles to boost electricity sales to make up for revenues lost to solar PV or energy efficiency. The report goes into great detail about what SMUD intends to do next to fine-tune their approach to DER integration, as well as what its findings mean for the utility sector more broadly. Greentech Media will be highlighting these kinds of DER-grid integration efforts at its Grid Edge World Forum, happening June 27-29 in San Jose, Calif. Join us for three days of in-depth discussion of the latest issues and opportunities in distributed energy and grid integration, and GTM Research analysis of the innovations happening at the grid edge.